In this page you find a review of articles dedicated to mixing and post production. Article by Computer Music, appeared on Music Radar magazine. The art of mastering is shrouded in myth and mystique, but with these 12 no-nonsense, practical tips, we aim to clear the conceptual fog and help you get your finished tracks sounding better than ever. Don’t expect mix problems to be solved at the mastering stage! EQ clashes, dynamic issues and other errors are all best addressed from within the mix project. If you’re applying drastic amounts of processing, revisit your mix – or if you’re mastering for someone else, explain the issues and see if they can remix. Once you’re ready to master a track, don’t just dive in and start processing. The aim is to gently improve, not ‘mix’. Take a more considered approach. Briefly compare the mix to a reference track at equal level, plan exactly what correction or enhancement the mix needs, try it out, re-level, then evaluate. Type in parameter values and use stepped plugins (with fixed 0.5-1dB ‘notched’ controls) where possible. It’s easy to just crank up a knob, but typing in values makes you think about what you’re entering. Stick to 0.5/1dB steps at a time, as half a dB will make a significant difference when mastering. 5. Does it cancel out? Remember to compare your final processed master with the unprocessed session mix – at equal level – to see if you’ve actually achieved the outcome you intended. If not, don’t be afraid to start again from scratch. 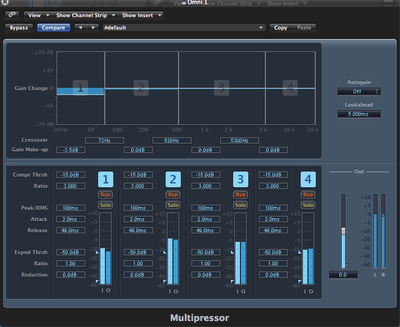 Several gentle stages of limiting or compression can help take the load off one single plugin. For example, three limiters with gain reduction of 1dB might sound more natural than a single 3dB limiting stage. It depends on the plugins used, so give it a try, and listen objectively. A plugin with an unlinked left/right mode can also be used to process in mid/side. Simply load Voxengo’s free MSED on the channel and set it to Encode. Now load your plugin after MSED and unlink the left and right channels. Place a second MSED last in the chain, and set it to Decode. The left side of your plugin now processes the mid (mono) part of your signal, and the right affects the side (stereo). For transparency, try to use as few EQ or excitement stages as possible. So, if a track has too much bass and not enough treble, try using a single broad shelf to cut bass, then re-level by increasing the EQ’s makeup gain. This will shift the track’s weight towards the treble more naturally than two EQ bands. Regular downwards, full-band compression can clamp down on peaks and transient detail, ruining dynamics if not applied carefully. If your track needs extra average weight, consider blending it in through the use of parallel compression – you can bring up the average level of your track while keeping the detail intact. A touch of downward compression can pull (or ‘gel’) the overall mix together, but keep attack times slow so you gently clamp down on the mix’s sustain and not the transients. A low ratio and around 1-2dB of gain reduction should be all that’s necessary. Many think of limiting and loudness as the main staples of mastering, but this attitude often leads to amateur results, flattened mixes and distortion. 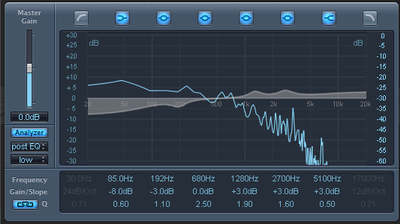 Final peak limiting should only be tackled when a track’s overall tonal, dynamic and stereo balance are in order. So leave limiting till last! Whether you are looking to add or remove sub-bass frequencies from your mix, it’s essential you’re armed with the right tools and techniques. Everything from a simple EQ to multi-band treatments and enhancers can be used, so there are certainly a few routes to choose from here. If you are in the business of creating club music of any kind, nailing these all important lows is a must. Get it right and your track will rock, leave them unchecked and your mix is in danger of becoming colored and your master distorted and quiet. 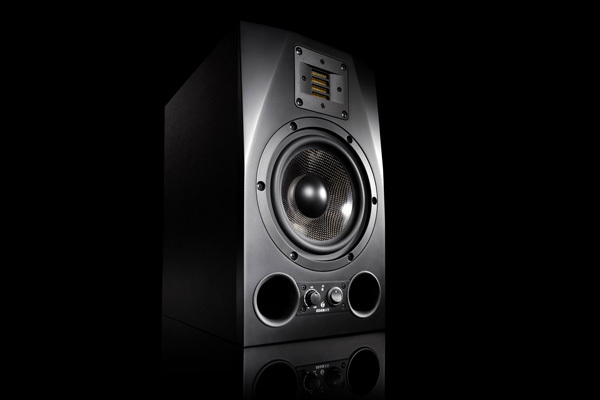 If you’re planning on making bass-heavy music with frequencies that register anywhere below about 50 – 60hz, the first thing you should do is check that your monitors are actually able to reproduce sounds in this range. There is no point in using processors to enhance or cut in this area if you can’t here what you are doing. Some larger monitors will go as low as 35-40hz giving you a pretty clear representation of what is happening with your subsonics but smaller monitors might only be capable of producing lows down to about 50 or even 60hz. This really leaves a huge gap in your mix. These frequencies may not be critical in certain genres of music but when it comes to music destined for the dance floor, they are nothing short of essential. Of course some of you may work in an environment where small monitors are a must to keep down noise levels, or budget maybe an issue so larger speakers may not be a viable option. If this is the case it may be worth thinking about mixing your music elsewhere, maybe a friend has a studio with a larger set of monitors where you can perform your final mix-down. Unfortunately the bottom line is these frequencies have to be heard if your mix is to work well on a large system. Another solution is to acquire a pair of monitors that are capable of reaching the low frequencies needed here. 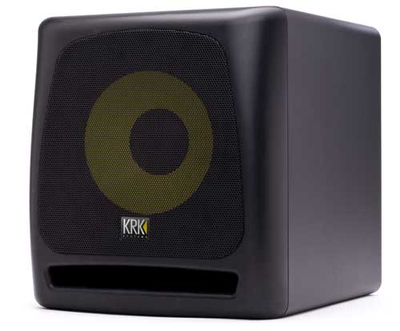 There are a few issues though; in order to reproduce sub-bass, speakers tend to utilize large bass drivers. 8 or 10 inch drivers are often required for the job and this tends to make the cabinets pretty large, which can be an issue if desktop space is limited. 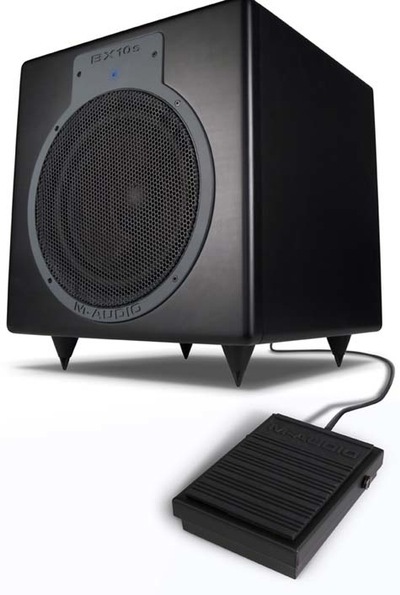 Large speakers can also present problems when used in smaller spaces and in close proximity to the listener. Arguably the best solution to evade all these issues is to install a dedicated sub woofer, and although this does involve some expense it is certainly the most streamlined method for reproducing very low frequencies. Professional quality subs can be extremely expensive but there are products on the market now that deliver a lot of bang for your buck and sport features that may not have been available even a few years ago. Most modern sub woofers will play back frequencies as low as 20-30hz with ease. If you do decide to use a dedicated sub then there are a few things you should look out for. An active sub is most likely to be the sensible choice for the modern digital set up as the amp is not only integrated into the unit but also matched to the drivers in the cabinet, a protection circuit is often present in this configuration, which helps avoid blowing anything up at high volume. Other features to look out for are internal crossovers which allow you to connect your main speakers to the sub and handy extras such as bypass foot switches for taking the sub out of the mix. Companies such as M-Audio and KRK are producing products with all these features for very reasonable prices. Once you have decided on the best way to monitor your sub-bass frequencies you will be able to hear exactly what you are doing across the whole frequency range. Assuming that you are good to go in this area, let’s have a look at some different tools and techniques we can use to manipulate our low end. Perhaps the most straight forward way to control the subs in a sound is to use a simple shelving EQ. This may seem a little obvious but once you have a monitor set up that produces low frequencies that were previously missing you may be surprised the effect a small amount of EQ has on a sound. As most EQ plug-ins go all the way down to 20hz it is pretty simple to add a few db of boost or attenuation to a sound in the area of 20-80hz. When you first start to focus on these lower frequencies it can be a good idea to use a spectrum analyzer to get some visual feedback on the changes you are making using the EQ. This, combined with some critical listening, can really help to fine-tune your ear to the subtle differences you will experience here. 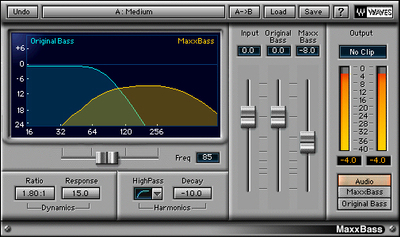 Some EQ plug-ins such as Logic Pro’s actually include a spectrum analyzer within its interface. As with most forms of processing the majority of us strive for transparency and attempt to avoid over-coloring our sound. With this in mind, using a shelving EQ to mildly boost or cut the subs in our mix can be preferable to using an enhancer or exciter for the job. Sometimes of course these more intense methods are necessary but it’s worth trying a more subtle approach first. Some sounds in our mixes will need to have their very low frequencies removed, to let other elements shine in this area. For instance a sampled guitar loop may need to have some low end removed to allow a kick drum or bass part to really stand out. You should really think about each sound in relation to the rest of your mix and ask yourself if its low frequencies should be removed or left intact. Closely managing your sub frequencies in this way will help you create a clear and focused low end mix, with real power. Even sounds that have had their low frequencies boosted can sometimes benefit from having some sub-bass removed. Most sound systems, even very large ones, don’t tend to produce frequencies much below 30hz, so having a lot of energy present in this area is not really necessary. This means you could be boosting 30-80hz and cutting below 30hz at the same time. This sort of treatment can also be useful in mastering. When it comes to the right tool for cutting these lows it should be pretty obvious that a standard shelving EQ just isn’t powerful enough, so we have to turn to high pass filtering for the task. A filter is a lot more abrupt than your average EQ and deals in absolute values. If we set a high pass filter to 200Hz, all signal below 200Hz will be removed. Filters can be pretty extreme but in some cases this is exactly what is needed. Saying this, many filter plug-ins will allow the curve to be altered thus reducing the intensity of the effect. When looking for the right filter plug-in to use, there are generally a couple of types to choose from. You will find many dedicated filters are resonant models, which work in pretty much the same way as the filter section on a synth. These are fine for removing specific frequencies from a sound as long as they are used without any resonance. 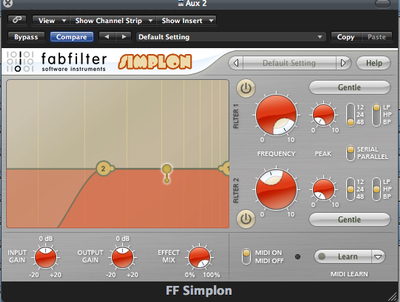 Fabfilter produce an excellent filter plug-in called ‘Simplon’ which is perfect for removing low frequencies and features a few different curves. If you find these resonant filters are too harsh or color your sound in any way, you can opt for something a little more musical. Many EQs, in both hardware and software form, feature built in high pass filters and these are often a lot more subtle and not quite as severe as their resonant counterparts. Try this approach when working with more organic sounds, such as recordings of acoustic instruments and vocals. 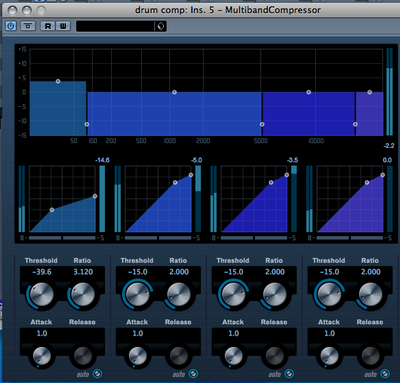 An alternative to using EQ and filters is multi-band processing, specifically multi-band compression. There are a huge number of excellent multi-band compressors on the market now and many DAWs such as Cubase and Logic include them as bundled stock plug-ins. The good thing about these processors is not just the transparent sound they deliver but also the fact that they are capable of adding or subtracting sub-bass frequencies. By simply adjusting the lower band of your multi-band compressor to cover everything from 20hz – 80hz you are able to process the sub frequencies in total isolation. Because these plug-ins are dynamics processors you also have the ability to tweak ratio, threshold, attack and release of the effect, as you would have in a standard compressor. This extra control creates the perfect environment for controlling sub-bass. The final type of processor we will look at here is the dedicated sub-bass enhancer. The reason I have left this until the end is that in my opinion it should really be used as a last resort. Not that this family of processors don’t often have a lot to offer but as with any other enhancer there is a danger that if you are not 100% sure what is happening under the hood, you could be doing more damage than good. Of course it is likely that you get what you pay for here and products from companies such as MaxxBass from Waves or even Logic Pro’s Sub-Bass can produce excellent results but some free plug-ins offering similar algorithms may play havoc with your low end mix. This doesn’t mean there aren’t some excellent free plug-ins out there, it just may be wise to choose very carefully in this area. If you feel that all other methods just aren’t cutting it, then you may want to try one of these plug-ins and if you find some of them a little intimidating or just fancy, try something with very few controls. 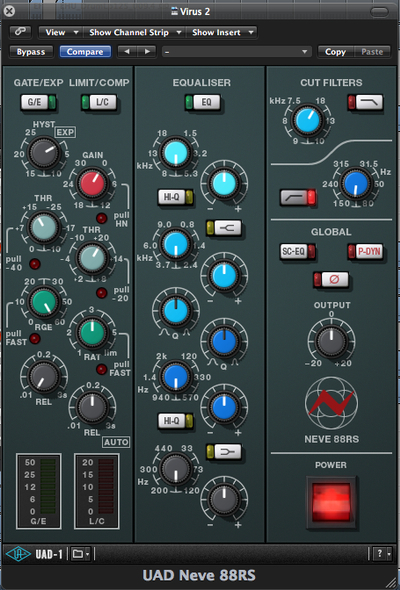 Look at the classic BBE Sonic Maximizer, now revamped and market by Nomad plug-ins. With only two knobs this little processor can work wonders on both the low and high end of any audio fed through it. If you want to try a technique that involves little to no processing to achieve a boost in your sub-bass frequencies, you could experiment with layering different parts. This can work with everything from bass lines to kick drums and percussion. It’s simply a case of adding a duplicate MIDI track under the original part and pointing it at a new instrument that is generating a low frequency rich sound. For example you may feel that a bass part doesn’t pack enough low end punch, simply duplicate the MIDI and use it to control a synth with a sine wave bass patch pitched one octave lower. Mixed carefully this simple technique can add all the bass you need without any processing at all. If you find yourself wanting to use a similar method but your bass line is an audio loop or sample, you may still be able to achieve the same result. Many DAWs now include technology that allow you to convert audio to MIDI. Simply put, this should allow you to generate a MIDI file from any pitched audio sequence. Of course, the quality of results will vary from one case to another but it is certainly an option here. Reverb is a classic mixing tool for adding width, but also that third dimension to your mix: depth. By adding depth to your stereo image, you’re also expanding the stereo image as a whole. Reverb will give you more room for every sound to breathe and settle into the mix. There are many different ways to use reverb and add space to your mix, but any reverb technique will add some degree of depth and spaciousness to your mix. And there are many types of reverb. Each is capable of adding a distinct vibe and depth to your mix. Choosing the perfect type of reverb to give that extra space without drastically changing your audio’s character will take some practice. But when it comes to width, Hall reverb is a good place to start. Don’t stop there though… all types of reverb can do wonders for adding three-dimensionality depending on your mix and production style. It can be useful to experiment with different reverbs for different tracks in the mix, or alternate dry tracks with reverb treated tracks. With small amount of effect, that can add unpredictable and variable spaciousness during the final mix. Dark Ambient technicalities. Michael Barnett interviews Sonologyst about creating dark ambient. (extracted from the Michael Barnett article: Dark Ambient 101: Understanding the Technicalities – http://www.thisisdarkness.com/2018/03/17/dark-ambient-101/ ). The mix of both of them is ideal. M.B. : What do you see as the differences between analog and digital creations of dark ambient music? S.: There’s no difference from a creative point of view. Obviously there are a lot from the technical one. M.B. : What are some of the key instruments/programs that you use to make analog dark ambient? S.: Analog synthesizers, electrified string instruments, guitars, samples, editing software and plug ins, percussions, wind instruments parts (commissioned to other musicians), tapes, pedals, dronin. M.B. : What are some of the key instruments/programs that you use to make digital dark ambient? S.: Mainly plugins to work on noise parts and editing softwares. M.B. : Do you see one or the other as being the “better” technique for creation of dark ambient music? S.: Everyone has to develop the better process fitting with her/him attitude. Drones? M.B. : What are some of the techniques you use to create drones? S.: There are different ones, maybe infinite. It’s possible to make drones with stratifications of synth pads, by editing acoustic instruments like brasses, winds, string instruments and so on; playing heavily distorted bass and/or guitar; editing samples, using noise from modular synthesizers, editing field recording, recording the washing machine noise and on and on.. M.B. : Do you have a favorite program/instrument to use for creating drones? S.: Not a specific one. M.B. : As a beginner did you create drones the same way you do now? S.: As a beginner I made a lot of mistakes before to find my way. M.B. : Have you changed techniques/software/instruments for creating drones over the progress of your career? S.: Yes I did it many times. And I continue to change to make the sound fabric different in any production I do. M.B. : How important are drones to dark ambient music? Probably drones are the dark ambient trade mark, as well the violin and piano are in the classical music for orchestra, or the electric guitar solos are in the rock music. M.B. : How important are field recordings to dark ambient music? S.: They are another fundamental component in dark ambient music. They are the ingredient to create visual atmospheres, vivid landscapes, even stories, and forge a solid concept when the musician has something interesting to tell through the music. M.B. : What electronics do you use to capture field recordings? S.: I’m not a professional of field recordings, so I use simply an IPhone when I’m around to catch everything could be interesting. M.B. : Do you leave the field recordings raw or do you add effects treatment to them? S.: I usually treat field recordings with additional reverbs. But the most important thing is to find the right level for the field recording layer in the mix. Mixing is by all means a crucial part in the process. M.B. : Do you use field recordings in the creation of drone or do you only use them as a secondary layer of sound? S.: It’s a possible choice to use f.r. for drones, why not? M.B. : Do you use human vocals in dark ambient? M.B. : How important are human vocals to dark ambient? S.: It depends of the concept behind the work, but I find human vocals important in my music, especially the spoken words. M.B. : Do you create your own passages to recite? M.B. : Do you use your own voice, hire a voice actor, or use samples from films/television/speeches? S.: Yes, samples from old documentaries, movies, speeches are my favorite. But I also asked singers to send to me parts for specific uses. M.B. : Is it necessary to ask permission of the original copyright holder before using samples of vocals in your music? S.: No, for they are usually very short samples or free samples. I prefer to escape all questions about DAW, computer and so on, simply because there are not peculiarities for dark ambient music. The logic of hardware and software is the same for all kind of music. Just I can add that I’m a graduated sound technician, so I learned technique of recording, mixing and mastering through regular courses. But as in all studies, the experience is the most important factor. Do it, do it and do it again. And after some years everyone will find the right set up and process. And for people like me, who don’t have big amounts of money to invest in expensive hardware and software, the experience will help to do more, using less. And this is a big advantage for creativity; when you have poor instruments and have to use your brain to find out something good. Take a few small stones, beat each other and record the sound by using some freeware delay and reverb. Probably you will be very positively surprised of the result. M.B. : Where do you go to find samples? M.B. : What samples would be off-limits in a legal sense? S.: There are a lot of free samples around, or simply usable by asking the owner permission. But for more specific knowledge of the argument I suggest to read the related laws of the source origin country. M.B. : How do you extract samples from movies, games, speechs? S.: Through Youtube when it’s possible by a software, but for more original sources by connecting the source (turntable, VHS player, microphones,…) to the audio interface. M.B. : How important are samples to dark ambient music? S.: Important, but not necessary. S.: I prefer to directly ask other musicians to realize the part, so to have a more natural and warm sound effect. Mastering M.B. : How important is mastering in dark ambient?S. : It’s fundamental. M.B. : Can a musician master their own album with limited training? S.: It’s not an easy job without a little of training. M.B. :What programs do you use to master an album? S.: It would be better if the mastering service comes from a person with a good sensibility for that kind of music. If a musician who plays himself that music, that’s even better. M.B. : What are the differences between mastering an album that is digital, CD, cassette or vinyl? Should each have a separate mastering? General AdviceM.B. : What advice would you give to a person just coming into dark ambient as a potential artist?S. : Just to work with passion and not to be hurry, releasing huge amount of music, just to show the audience what is going on. That is a mistake many people do, while the process to improve the own style should be something private. M.B. : What are the best aspects of creating dark ambient? S.: It gives to you the possibility to be in deep connection with you profound states of mind. M.B. : What are the worst/hardest aspects of creating dark ambient? S.: There aren’t worst aspect to me. M.B. : What are somethings an amatuer should avoid doing at all costs? S.: Every artist has to find the own way for that. It’s impossible to give a general advice. In my case I found the good and natural rhythm working on one release a year. And I don’t exclude to increase the interval between two works. That lets me a major deepness, awareness and consciousness of what I’m going to do. Basically I start a work when I have really something to communicate, and after I’m aware of that, I need time to explore how to communicate it. M.B. : Should a musician know the history of the genre before creating their own music? S.: Not necessarily, but it would be a crime to ignore all that beautiful music created in latest decades. Reverb is necessary in order to create the impression of distance and separation between elements, but it also contributes a lot to the ‘glamour factor’ you’ll need for a modern commercial production. Quite simply, making the wrong reverb choices is a strong indicator of a non-professional mix. It is potentially so destructive that many of us are either too conservative when we use it – resulting in no real benefit – or else it’s applied too liberally and smears over all your previous delicate mixing manoeuvres. A good general piece of advice would be to use short reverbs in busy mixes, longer reverbs in music with more space. What can be deceiving though is to judge the validity of reverbs by name i.e Halls and Chambers as long, plates and rooms as short – if you think you need short reverbs you could find exactly what you want from a short Hall and you could find just the tail your after in a mix using a long plate. Rather than thinking purely in terms of long and short, think in terms of the quality of the tails, longer tails can disguise the presence of reverb where short ones can draw attention to it. Pre-delay is the single most powerful feature in most reverbs, setting a pre-delay allows for a certain amount of dry signal to get through before it is washed in reverb, this means greater intelligibility. It is particularly useful for keeping the attack of words from a lead vocal upfront and clear. In this sense it is much like how you use a compressor, setting a slower attack time or in the case of reverb – pre delay, lets vocal information through which is re-assuring to listen to. Anything from 20ms to about 80ms will be the area you need to work in – beyond this you will create a distinctive slap back effect that could be cool in the right circumstances but less suitable for most. For a far more dimensional reverb and richer spaces you should try using multiple reverbs together. For example, using three you can create a much more convincing ambience. Successful reverb should enhance the mood you are aiming for; it is not just about adding size, but embellishment of your central theme. It is a taste thing of course, if the reverb is a big feature of your production ala Phil Spector, you’ll use a lot more than if you were just using it to blend, glue and create a believable ambiance. Remember that a little reverb goes a long way. When it comes to applying reverb, solo the instrument or voice, then bring in the reverb until you can hear it, then back it off a smidge until you sort of feel you want a bit more. That’ll probably be about right. Hopefully you are aware of the benefits of high and low pass filters, and you’ll have been applying these to instruments in your mix already to keep low end rumble and other toxic frequencies at bay. The same wisdom works on reverb, high passing reverb with an EQ – i.e. rolling off its low end will keep the space open. 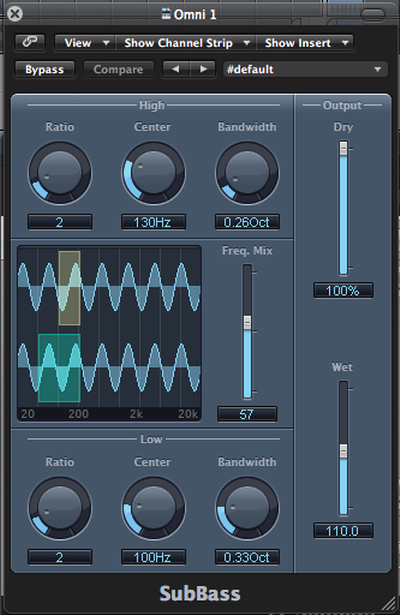 Leaving the low end in, could mean you lose definition as you add more reverb to more channels. Reverb can be especially useful for brightening vocals where you might feel that EQing the vocal directly is working against you. This same approach can of course be used on any instrument, the trick is to identify the presence EQ range and then boost that in the reverb. For example, vocals usually have a strong presence around 3K, so, rather than EQ the vocal audio, instead, insert an EQ after your reverb and push that in the 3K area to get a more airy, transparent lift. Snare drums can regularly benefit from gated reverb, whereby a half second or so pre-delay followed then by a reverb that is gated, i.e. cut short abruptly – creates an un-natural, but useful artefact that might be described as smashed glass. The effect if used proportionally and blended well will give dimension to the snare without adding body. Used heavily it is a very distinctive effect brought to popular consciousness by Phil Collins and David Bowie, however, despite how dated it can make a drum sound, it is still used a lot for sound re-enforcement even in today’s most cutting edge productions. A useful tip for gauging the effectiveness of your reverb, especially if you are using multiple reverbs is to group them together so you can then solo or mute them with a single mouse click. Being able to A/B processing in this way can be very informative and help you reign in your levels or feel confident about adding more. Having control of all your reverbs on a single fader will allow you to fine tune how you want them, plus you can of course apply EQ as mentioned in tips 5 & 6. We often think of reverb being stereo but there is huge benefit to setting up mono reverbs. Certain instruments take better to reverb than others, some don’t play so nicely. Often we like electric guitars to feel upfront, but regular reverb tends to soften their impact. Spring reverb and certain other lo-fi processors work especially well, the harshness of them can add body and presence to the audio, don’t discount cheap sounding processors and springs for use on vocals either, for a vintage lo-fi vocal reverb springs are extremely fashionable right now. We often think of reverb being stereo but there is huge benefit to setting up mono reverbs. Mono reverbs are great for spot lighting or where you want to draw attention to an instrument without swamping the mix. If you wanted to spot light a keyboard solo that was panned off to the right, setting up a mono dedicated processor and then the pan to match the pan setting of the keyboard, will really help retain the dynamics in your production. Reverb fashions come and go and presently we seem to be in a phase of rediscovering reverb. Reverb today is generally very musical and subtle: We want it, but we don’t want it to be over bearing. Modern vocal tracks and spot FX will tolerate a good deal, but we like drums to feel natural, textural and upfront. The main thing to keep in mind is that successful reverb should enhance the mood you are aiming for; it is not just about adding size, but embellishment of your central theme. The answer is YES! Making a mix post production for vinyl means to make an alternate version after the digital one, with little to no digital peak limiting, and a little more headroom in the analog domain. Sending a loud and aggressive CD master to a lathe will only cause the cutting engineer to have to turn things down significantly, and in many cases they’ll be forced to cut an even quieter record than they would have with a more dynamic premaster. Your mastering for vinyl doesn’t need to be as loud as your CD master because the volume of your vinyl will be determined by the length of the sides, which means to keep louder more aggressive material near the outer edge of the record (early in the side sequence), and the more subdued and less aggressive tracks near the inner grooves (where noise and distortion become more of a consideration). A digital master for CD has to have a 16-bit word length, and it can be as loud and as limited as the client’s taste or insecurity dictates; with the vinyl master there is a physical limit to what can be fed to the cutting head of the lathe, and so heavily clipped masters are not welcome and can only be accommodated, if at all, by serious level reduction. For vinyl, the optimum source is 24-bit. Things can get more tricky if the primary focus is the digital master, and especially when that is required to be fairly loud. You can’t simply take an unlimited file and add 4 or 6 dB of limiting without sonic consequences, and so for loud CD masters, we normally add another step of gain-staging and include some light limiting during the initial processing run, the result being a louder master to begin with for the second stage of adding gain. In this case the difference between CD/digital mastering and the vinyl one will be more relevant. So before to go on with an alternate version for vinyl mastering, think about what’s the priority in your music distribution strategy and then talk about that with the sound technician who will care about your project. The goal of this step is to correct mix balance issues and enhance particular sonic characteristics, taking a good mix (usually in the form of a stereo file) and putting the final touches on it. This can involve adjusting levels and general “sweetening” of the mix. Think of it as the difference between a good-sounding mix and a professional-sounding, finished master. The introduction of the standardized RIAA curve meant that equalization (EQ) became part of the mastering discussion. Intended to allow records to be cut with narrower, tighter grooves (and thus, a longer playing time), one side effect of this curve was that the pre-emphasis curve applied to the recording could enhance high frequency transient peaks, and the de-emphasis applied upon playback could cause a boost in low frequency energy that would cause the stylus to pop out of the groove. Slowly but surely, the necessity of these tools to ensure a positive consumer experience meant that the skills of those who could utilize them effectively became highly prized. Some engineers (notably Doug Sax, Bob Ludwig, Bob Katz, Bernie Grundman and others) began to focus exclusively not just on the practicality of these tools, but also ways in which they could be used to further enhance the listening experience. Mastering advices for beginners from experts. What’s your best advice for a beginner who is just starting out mastering, and wants to develop their skills? Producer Jon Griffin presents a straightforward guide to ensuring great results, and avoiding the many pitfalls, when mastering your own tracks. Mastering is essentially the process of preparing your song, or collection of songs, for the commercial market. The aim of mastering is to present a coherent final product that translates well onto all kinds of listening systems and environments in the real world, beyond the relatively pristine confines of the studio. In practice, mastering is primarily about fixing troublesome frequencies, lifting detail, balancing and enhancing the stereo image, and of course making the work competitive in terms of overall loudness. Of course, mastering can also involve more than this, but here we are going to focus on the essential processes that can be undertaken in your own studio, particularly when hiring a professional ME (mastering engineer) is not cost effective. The more familiar you are with the mastering process, the more this can help you make good mixing decisions. Mix balance is king here, and so is maintaining headroom and a good dynamic range. Make sure none of your individual instruments or vocals go beyond 0dB where they will clip or distort: Even if your mix overall has good headroom and is well short of distorting, any peaks caused by tracks spiking above 0dB may become more apparent while mastering and severely compromise the mix. Keep control of your mix dynamics by adding small doses of compression at different stages rather than heaping it on in one sitting, so a little compression while tracking, a little while mixing, a touch of limiting here and there and maybe even a touch on the mix buss itself. By the time you are printing off a mix, those compression touches will add up to a mix that is solid, without being lifeless and have just about the right headroom and dynamic range left that you or your ME would need. You want to keep your loudest peaks with at least 1dB of headroom below zero, but really you can comfortably aim for greater margins, -3dB below zero would be even better. You don’t want to worry about ensuring your mix is loud – that is what mastering is for. Some engineers are even printing mixes at -18dB because they feel there is some sonic benefit. Your mix file can easily be brought up in level without issue with gain plugins or the clip gain functionality in most DAW’s. What you want to avoid at all costs are peaks above 0dB. It is far better to maintain headroom by printing a quieter mix than to squeeze every possible decibel out of it and risk going over before it even gets to mastering. A track with good dynamic range feels musical and exciting, whereas a track with poor dynamic range feels tight and fatiguing. Dynamic range is the difference between the loudest and quietest moments in your music, and is also essential to preserve. A track with good dynamic range feels musical and exciting, whereas a track with poor dynamic range feels tight and fatiguing. How much dynamic range you build into any given mix is largely a judgement call you make based on taste, style and genre. Genres like pop and electronica tend to have less dynamic range than jazz, classical and other acoustic music. As a mix engineer you don’t necessarily want a mix that is too dynamic, but you certainly don’t want one that has no dynamics either! Meters like the Brainworx BX Meter that give real-time visual feedback on the dynamic range are popular tools and can help guide you in this respect. You want to avoid using your limiter to deliver lots of gain at the end of your mastering chain. Ideally you only want to lean on them for a few dB, so make sure your audio file is at a good starting level either by using a gain plugin or, using the clip gain feature in most DAWS. Gaining will not affect your dynamic range only your headroom, you still want to keep enough headroom to apply your processes, but you don’t want the file to be so quiet that you are cranking the limiter to take up the slack. Check a phase meter for good stereo representation: a nearly static line down the middle of the meter suggests there is little to no stereo quality; the result can be a lifeless, congested sounding mix. The solution could be as simple as inserting a basic widener and opening it up, fanning the mix out like a deck of cards. This leads to possibilities for additional surgical processes. EQ is 90% of the mastering process. Well-known and highly experienced mastering engineer Craig Anderton preaches that EQ is 90% of the mastering process. If you are boosting or cutting EQ, a great piece of advice from Craig is to push the EQ frequency gain to where your ears want it…then halve your move. If you are boosting 3kHz by 3dB, bring it back to 1.5dB, that will probably be enough. In terms of EQing the mix generally, take time to listen first for the obvious things. Purposefully listen to the bass, the mid range, upper mid range and the highs. While trying to detect faults may seem like looking for a sonic needle in a haystack, start broad and you’ll gradually zero in on any issues if there are any. If you can’t detect anything you know you could improve, don’t EQ anything. Stereo enhancement, or “widening”, involves spreading the various elements of a mix out over the stereo spectrum, pushing more sound to the extreme left and right. This can be a significant and satisfying part of the mastering process, often transforming a track with a single turn of a knob. The downside is that it can also destroy a mix by either creating an un-real sense of space or by introducing phase issues and compromising energy levels. The temptation can be to widen as far as your plugin will allow, but a more sensible approach is to apply it only to the point where you miss it when you take it out. Stereo enhancement can be especially useful for tracks where a certain instrument or the vocal is getting lost in a busy mix. 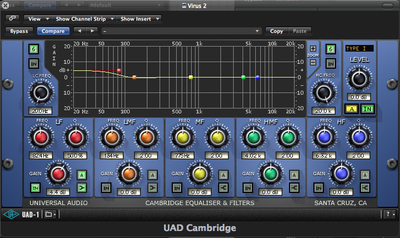 Wideners can be especially useful for songs where a certain instrument or the vocal is getting lost in a busy mix. This is commonly because of an excess of information focused in the same ‘space’, either in terms of frequency or panning. Mixes that lack stereo information will be worse for that. Use a widener to fan out the mix, followed by an EQ boost to the fundamental frequency of the instrument or vocal you want more of. Typically you could look at boosting a vocal in the 3-4kHz range. Compressors control dynamic range. If the mix is too dynamic or just needs a little more punch, a couple of dB of gain reduction from a compressor can really help stabilise the mix. You’ll need to think in terms of long attack times to avoid squashing the transients. Compression can really help in terms of scoring additional headroom and adding gain. If you are not getting the loudness level you want at the limiting stage, go back to your compressor and squeeze it some more rather than digging deeper into your limiter. A useful technique for achieving strong but transparent compression is to use two compressors in series. A useful technique to keep compression transparent and yet still achieve lots of gain is to use two in series, thus halving the workload on each. You get a cleaner, less obviously compressed sound because the circuits in each are being driven less and recovery times are near instantaneous. The final stage is to cash in any remaining headroom and bring the mix level up as high as you can without clipping. Limiters are essentially compressors with super fast attack times and high compression ratios. You might start by setting the ceiling of a limiter to 0dB and then draw down the threshold to meet the audio peaks. The threshold is tied to an auto gain function, so the more you reduce the headroom and dig into the peaks, the more loudness you get back. However, there is a trade-off here: the more you flatten the peaks, the less dynamic range you end up with. Mixes with too much limiting may appear loud, but in truth they feel flat, lacking dynamic energy and excitement. The trick is to be careful – a little limiting goes a long way, and heavy limiting very quickly gets ugly and amateurish. One last point worth mentioning as a word of warning: you could hypothetically set your limiter to 0dB, thereby thoroughly exploiting any remaining headroom, and achieving maximum possible loudness. After all, you would think, if you have a limiter in place, you should be fine right? None shall pass and all that? Well, yes, but there are certain digital processes that are required to smooth audio and in so doing they can add an additional thin layer of gain after the limiter: this could be enough to clip the master buss if your mix is already running right up to the limit. Therefore, it’s far better practice to allow perhaps 0.5db to act as a super safety net.